Do We Pay Attention to Reader Ratings? 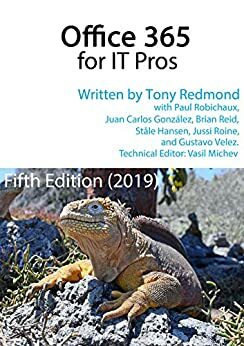 The Office 365 for IT Pros writing team is a pretty pragmatic bunch, and we don’t spend a heap of time checking if the book receives reviews and ratings. Life’s too short and we have other stuff to do, like checking what’s happening inside the sometimes crazy world of Office 365. All of which explains why we totally failed to notice that the book had accumulated a nice number of five-star ratings on Gumroad. com (where we sell the EPUB/PDF version). In fact, we never knew that Gumroad allowed readers to rate books (Gumroad posted a Twitter update on January 31 to say that ratings was the largest feature they had shipped in a while). We have a page to record comments we’ve received and do see comments posted on our Facebook page when we post messages there, but checking Amazon for reviews and ratings is not a daily priority, especially has the 2019 edition has received just one rating on Amazon.com and another on Amazon.co.uk. This amuses us because the last edition (2018) received 29 reviews! Clearly we’re not doing something right. What we do value enormously are comments from readers that help us find problems or identify topics we need to cover. Broken hyperlinks are the bane of our lives, so it’s great (in an odd way) to hear from someone when they find a bad link. Everyone has an idea about what should be in the book and we like hearing about this too, even if we don’t always agree to include extra content (the book’s pretty big already). If you have a comment, please use the contact form on this site to tell us. Or if you’re more comfortable with Facebook, post the comment there. Either way, we’ll respond. It is really helpful when you tell us the chapter, heading, or page number where the problem exists and what update you’ve found it in. Remember that we update the book monthly, so a problem in the March 2019 update might not exist in the April 2019 update. That’s one good reason to always download updated files after we release them. This project has only succeeded (so far) thanks to the support we’ve received from the Office 365 community. Keep on sending those comments to us.